The erection of roofs and trusses is another area in which our supplier can provide excellent service. They have been involved in the roofing industry for 15 years now and have subsequently built up a reputation for being reliable and affordable. Marley has been manufacturing stylish concrete roof tiles for over 35 years. Their tiles are SABS approved and are coated with their own scientifically formulated roof tile coating. Marley Roofing is a member of the CMA (Concrete Manufacturers association) and has won the prestigious CMA award for excellence, for a few years running. The Marley range of tiles consists of 7 different styles with matching overlapping fittings which provide a superior, maintenance-free finish. Lafarge(Coverland) has been in the roof tile manufacturing industry for over 30 years and is an amalgamation of 4 major concrete roof tile manufacturers who named their product range Coverland for obvious reasons. The Lafarge range is comprised of only 4 different styles, but they have a new range called Arkitone, which allows the customer to choose a range of tiles made up from a vibrant and exotic mix of coloured roof tiles to suit any designer's taste. Timber roof trusses are the recommended structural support for domestic roofs constructed in South Africa. 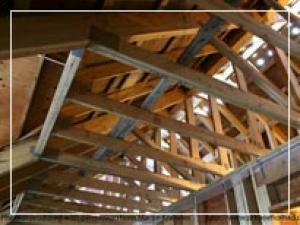 Roof trusses are made up of a framework of triangular shaped units. Each triangular unit lends its ridgidity and strength to the overall support structure which is the roof truss. Pre-fabricated roof trusses should be constructed from high grade SABS approved timber by an approved manufacturer or supplier. Trusses are engineered to design specifications and are therefore not necessarily limited to standard shapes or sizes. You don't pay for wastage like timber off-cuts and excess nail-plate fasteners. On-site carpenters are expensive to use as they charge tradesmen's rates (and they're not qualified engineers). Time saving process as the work is mostly done off-site which allows other contractors more time on-site.